Highways are the backbone of our Nation's transportation system. They play a vital role in the Nation's economy as well. In 2004, the Long-Term Pavement Performance (LTPP) program continued working toward optimizing the public's investment in the highway system by providing the information, data, and products that highway engineers and managers need to design, build, maintain, and manage cost-effective and better performing roads. This report outlines LTPP's 2004 program area accomplishments and how the TEA-21 extension impacted the LTPP program. The LTPP program was established as part of the Strategic Highway Research Program (SHRP) in 1987 and has been managed by the Federal Highway Administration (FHWA) since 1992. LTPP was designed as a partnership with the States and our neighboring Canadian Provinces. The idea originated with State highway agencies across the Nation that needed to repair and replace a considerable amount of pavement due to the stress of increasing traffic loads and volume. Recognizing the need for an extensive long-term program of research into pavement performance, these agencies outlined a work plan, invested funds, and provided staff support to get the program rolling. Hence, a strong partnership was forged between States, Canadian Provinces, American Association of State Highway and Transportation Officials (AASHTO), Canadian Strategic Highway Research Program (C-SHRP), Transportation Research Board (TRB), and FHWA. All share a critical role in the success of the LTPP program. In 2004, the LTPP Team continued to strengthen this partnership through increased communication and personal visits to many partner agencies. LTPP has completed 15 years of collecting pavement performance data. Analysis of this data has resulted in several products that are currently being used by some agencies, but the work is not yet complete. More products are planned to help design, build, and maintain our highway infrastructure. Our primary goal is the development of useful products that highway agencies can implement. An ongoing dialogue of what both the partner agencies and LTPP need from each other is critical to continued success. Spark renewed interest and commitment by the States and Provinces to help the LTPP Team successfully complete the program. Inform and update agency staff about the status of LTPP's program activities. Provide agencies with LTPP's plan for collecting missing materials and traffic data. Provide agencies with the status of data collected at their LTPP test sites and what they can do to help LTPP fill in the gaps. Answer the agency questions about the LTPP program. During the past year, considerable time and energy went into preparing for these face-to face meetings with the agencies. As a result, more States and Provinces agreed to join the Specific Pavement Study (SPS) Traffic Data Collection Pooled Fund Study. As part of the Materials Action Plan, FHWA will collect the samples from many agencies that are needed from the SPS sites. The partner agencies in turn will provide traffic control and a core drill rig to support this effort. States and Provinces have also provided rehabilitation and maintenance data that was missing from the database. Most notably, a connection was made between those who manage the LTPP program and the owners of the test sites. For LTPP to be fully effective for future pavement research and the development of useful products, it is crucial that the States and Provinces renew their commitment to help complete the program. This includes providing traffic control for data collection, maintaining the LTPP signs at the test sections, and continued vigilance for keeping all test sites in the study for as long as possible (as long as they do not pose a safety hazard to the traveling public). As we enter into the final years of this 20-year comprehensive data collection effort, LTPP is committed to keeping this dialogue going with all its partners. Since its inception, LTPP has depended on the cooperative efforts of the highway engineering community. Figure 1 is a graphic representation of LTPP's partners and their respective roles, while the summaries below describe how each partner contributes to the LTPP program. Each of these partners will continue to play a key role in helping LTPP achieve its full potential. Collect traffic volume and weight data. Report maintenance and rehabilitation activities. Provide traffic control for pavement data collection activities. In their role as builders of today's highways, the States and Provinces are the primary users of the results garnered from the LTPP program. Now, with the new Mechanistic-Empirical Pavement Design Guide (M-E PDG), the LTPP data will be important to the local and regional calibration of this guide. AASHTO has been critical to past successes in test section recruitment and the adoption of LTPP-developed methods, procedures, and guidelines as standards for pavement engineering. The TRB provides an independent forum in which the States, Provinces, industry, and academia contribute input and advice on the conduct of LTPP research and implementation activities. The TRB LTPP Committee provides management-level feedback on the direction of the LTPP program. In addition, several topic-specific expert task groups review technical details. The FHWA LTPP Team under the Office of Infrastructure Research and Development (R&D) manages the day-to-day operation of the LTPP program in collecting, processing, and disseminating data, along with national analysis activities. 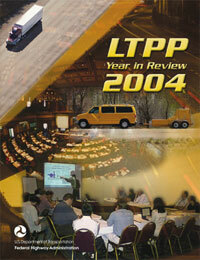 In 1996, FHWA established an LTPP Implementation Team, known today as the LTPP Product Team. The Team's mission is to turn LTPP research findings into practical engineering tools. Reductions in basic data collection (deflection testing, profile surveys, manual distress surveys, and other field activities) and processing activities to levels below previous years and well below those required to complete the LTPP mission. Postponement of important data collection activities, including drainage surveys, forensic investigations within test section (using ground penetrating radar for thickness surveys), and some quality assurance (QA) review activities such as the profiler and falling weight deflectometer (FWD) comparisons. The purchase of much needed new equipment was also postponed. Termination of the seasonal monitoring program. Postponement of development and population of key computed parameters for storage in the database. The most salient of these parameters is the dynamic modulus of hotmix asphalt concrete mixtures, essential in the calibration of the new mechanisticempirical pavement design guide at the regional and local levels. Other computed parameters also affected include the moisture content of unbound layers from time domain reflectometry (TDR) readings, frost depth determinations from resistivity measurements, and elastic layer moduli backcalculation from deflection data. Cessation of procurement planning. Two major planned contract procurements ready for advertisement have been put on hold- the photographic distress survey contract and the SPS material testing contract. Reduction to bare minimum work assignments on previously awarded data analysis contracts. No funding was made to new product development activities. Some potential products were placed on hold. Reduction or postponement of key ancillary information management system (AIMS) activities, including work on the LTPP library, data, and other information not contained in the pavement performance database, such as raw profile and deflection data and distress photographs and images. AIMS activities combined with the database are vital to the program's mission because they represent the LTPP legacy. Decreased vital communication and coordination activities, especially with the TRB LTPP Committee and expert task groups. No meetings have been possible, and coordination activities have been limited to a few teleconferences. Because of the short duration of the funding extensions under which the program operated in FY 2004, LTPP management must plan and execute program activities reactively (ad hoc) instead of proactively, leading to inefficiencies and, more importantly, the inability to collect time-sensitive data. The above adjustments have an immense effect on LTPP's 20-year life span. Perhaps the most critical impact of the decreased funding is on the ability to monitor aging pavement test sections at needed intervals. Reductions in monitoring frequency cause sections to go out-of-study without the last round of condition measurements. Depending on budget resources allocated in the coming years, a 2-year extension to the program may be required to complete the mission. Highway agencies are under pressure to produce pavements that perform better and last longer. The new tools they need will emerge from research and development; a major element of that research is already well underway in the LTPP program in these examples. The LTPP database, even while under development, is already helping in the development of new tools. The new mechanistic-empirical pavement design guide-a major step forward in the application of pavement design-relies heavily on the LTPP data. LTPP data are being used to verify the utility of new tests proposed for inclusion in the Superpavetm system. Completing the LTPP mission is vital to the improvement of long-life pavement design. The years since the inception of LTPP have been full—from foundational planning and experiment design to data collection and the creation of a comprehensive database. Analysis of the data has enabled the verification of critical pavement design, construction, and rehabilitation parameters. Our long and credible history supports the creation of critical new products. Indeed, the data collected from the LTPP experiments played an important and comprehensive role in developing the M-E PDG. In the mid-1990s, the AASHTO Joint Task Force on Pavements proposed a research program to develop a pavement design guide based on mechanistic-empirical principles with numerical models calibrated with pavement-performance data from the LTPP Program. A mechanistic-empirical approach to pavement design combines knowledge about the behavior (mechanisms) of pavement materials with observations (empirical information) about how pavements perform. The LTPP database was the single largest data source for the National Cooperative Highway Research Program (NCHRP) 1-37A M-E PDG model calibration and validation. LTPP data were also used to derive default input values for certain data elements such as traffic loading, some material properties, initial International Roughness Index (IRI), and critical distresses. Furthermore, LTPP data were the source for developing procedures to integrate or serve as the basis for generating design inputs and pavement evaluation. States and Provinces with GPS and major SPS experiments may apply the M-E PDG models to establish validity and/or to conduct a local calibration. LTPP data used as part of a local calibration effort is valuable, because it may reduce error and/or remove bias of the predictive model. This will favorably impact the design reliability results by providing more optimized and less expensive designs for the State. LTPP data can be used to derive regional input default values and populate or supplement the local traffic and/or materials data reference library. LTPP data may be used to generate local typical inputs for materials, traffic, rehabilitation, limiting distress, and IRI. The LTPP program will also be the source of additional data and research findings to support future enhancements of the M-E PDG. The NCHRP Project 1-37A used the 2000 LTPP data release. In nearly 5 years since, much more data (for example, traffic and materials data and longer performance data for key LTPP experiments) have been added to the database. Findings and feedback from continuing analysis of LTPP data provide insight which allows the program to make the database more valuable. In 2004, LTPP continued to make a strong effort to add missing materials data with permission from States and Provinces to collect samples needed to fill the gaps in the LTPP database. LTPP finalized the SPS Materials Data Action Plan and began its implementation at Maine's SPS-5 site. Subsequently, this plan will be used to collect the necessary samples to get the required data from other SPS test sites. Resilient modulus testing of bound and unbound materials continued in 2004. Conducted 900 manual distress surveys at the LTPP test sites. Received, reviewed, and processed 1,000 new film distress surveys for entry into the database. To date, 10,546 film surveys have been performed and entered into the LTPP database. Reinterpreted 500 film distress surveys originally done using older software and reentered the improved data. Fulfilled over 1,000 requests for the revised Distress Identification Manual for the LTPP Program. Provided graphics to the North Dakota Local Technical Assistance Program (LTAP) Center for their use in the development of a pocket-size version of the manual. Completed the Distress Viewer and Analysis (DiVA) time series distress quality check review software for the Oracle® database. Depending on LTPP funding, this software will be modified to work with the standard Microsoft® Access data release. Conducted FWD tests at 921 LTPP test sections in 2004. Conducted profile tests at 1,424 LTPP test sections in 2004. LTPP continued operating the high-speed inertial road-profiling systems in 2004. The final report for the 2003 Comparison Testing of LTPP Profilers conducted at the Minnesota Road Research facility was complete in April 2004. LTPP also completed the LTPP Manual for Profile Measurements and Processing, Version 4.1 in May. A study on Dipstick® footpad spacing was completed and the resulting changes to the procedures were incorporated in the new manual. The latest profile software, ProQual 2004, Version 4.1 was released. The LTPP Weigh-In-Motion (WIM) Pavement Smoothness Index was adopted by FHWA and it will be considered for incorporation as part of the Pavement Profiler Viewer and Analyzer (ProVAL) suite of profile analysis software. Because the LTPP database is comprehensive, it has the potential to serve as the foundation for developing future products in pavement engineering. Consequently, ensuring that the data elements collected and stored in the database are accurate requires LTPP to maintain its high quality data collection procedures and strict QA/QC protocols. In line with the Office of Management and Budget (OMB) guidelines for data quality provided to the public, the LTPP program office reviewed the Data Quality Act and found that LTPP meets or exceeds the standards suggested by the guidelines in terms of relevance, timeliness, transparency, QA/QC, and customer service. The LTPP program was invited by FHWA to participate as a case study for compliance with the guidelines. In 2004, LTPP released Standard Data Releases 17 and 18 of the Pavement Performance Database (PPDB). A strategic plan for completing the database was developed. The plan outlines software and equipment upgrades scheduled for 2005, completion of a program assessment circa 2006, and a final decision by 2007 on the final state of the database from platform, interface, and host standpoints. Improvements to the LTPP database were made to support the ongoing efforts to fill in the materials and traffic data gaps. As a result, SPS-9 materials construction tables, specific gravity of unbound materials, cross-slope, ground-penetrating radar (GPR), drainage, and changes to the axle distribution data tables were added. An update of the climatic data since 1997 was added as well. In preparation for successfully completing this 20-year research study, LTPP began to catalogue and archive data that is not part of the PPDB. These data are components of AIMS. They include information such as the digitized manual distress maps, digitized automated distress film and photographs, and the raw FWD, profile, and traffic data. LTPP consulted the Bureau of Transportation Statistics National Transportation Library in this endeavor. The intent is to provide the public with information about the availability of the AIMS online so that they may request this data through the LTPP Customer Support Services Center. In 2004, LTPP continued to follow the guidelines of the TRB LTPP Committee that the Data Analysis Strategic Plan is a coordinated set of interrelated analyses, with the outcome of some becoming input to others. In addition to looking at how the results can be used within this strategic plan, LTPP also looked at the research efforts that the Design Guide Implementation Team are making to coordinate the work done by the two programs. LTPP updated the Data Analysis Strategic Plan to reflect the status of each project in terms of budget, completion date, products, report status, and planned activities. A Web site was created to facilitate easy access to analysis project information. You can access it at www.tfhrc.gov/pavement/ltpp/stratplan/strategic.cfm. Although some potential products were placed on hold in 2004, LTPP distributed several products to users. An alpha version of the Any Time Weather software program was developed, along with a beta version of the LTPPBind 3.0 software program. LTPP demonstrated a beta version of the bumpfinder software to State agencies and plans to add this to the ProVAL software suite. LTPP made final additions and updates and released 300 copies of the Seasonal Monitoring Program CD-ROM (3-CD set) version 1.2. These copies were distributed to State highway agencies. LTPP provided funding to participate in the development and duplication of a Distress Identification Manual Pocket Guide in conjunction with the North Dakota LTAP Center at North Dakota State University. A number of agencies indicated interest in receiving copies of this manual once it is printed. LTPP distributed nearly 1,000 copies of The Guide for Determining Design Resilient Modulus Values (Mr) for Unbound Materials CD–ROM and is seeking funding to make more copies. The CDs were distributed to States, Provinces, localities, and industry professionals. In 2004, LTPP performed QA reviews at three of the four regional FWD calibration centers: the Texas Transportation Institute, Colorado Department of Transportation and the Pennsylvania Department of Transportation. A QA review was not conducted at the Minnesota Department of Transportation calibration center because the facility is currently closed while addressing concerns in the performance of the reference deflection system. LTPP began replacing Dynatest Version 25 data collection software with Dynatest FWDWin. Version 25 runs on the Microsoft DOS operating system, which is incompatible with modern computer hardware and software. The FWDWin software supports multiple output file formats and operates on Microsoft Windows operating systems. LTPP anticipates using the AASHTO-adopted Pavement Deflection Data Exchange (PDDX) file format for processing and archival purposes. FWDWin software is customized to allow for LTPP-specific data collection quality control features, and new database filters have been developed as well to accept the new file format. In 2004, the LTPP Regional Support Contractors (RSCs) began testing FWDWin in late August to identify problems or benefits of the new software. Feedback received was applied to improve the data collection process and software modifications. Formal training for LTPP FWD operators was conducted in November 2004 to verify consistent operator adherence with protocol and repeatability among equipment across regions. Full implementation of the new software is expected in January 2005. LTPP partnered with the States through a pooled fund effort to collect at least 5 years of research quality traffic data at the SPS-1, -2, -5, -6, and -8 test sites. Research quality data is defined to be at least 210 days in a year of data of known calibration that meets LTPP's precision requirements. There are two phases to this study. Phase I consists of doing site assessments, performance evaluations, and validation of existing equipment. Phase II involves purchasing, installing, and maintaining new WIM systems at those sites that do not pass the Phase I site assessment or performance evaluation or do not have equipment installed. In 2004, the Phase I contractor performed a site assessment at the SPS sites for all agencies contributing to the study. A performance evaluation and calibration was done at the SPS sites in Florida and Ohio. The remaining SPS sites were not recommended for further evaluation due to issues with the equipment and/or smoothness of the pavement. The LTPP program office worked with the remaining contributing States to address the corrective actions needed to get the sites prepared for passing the performance evaluation and calibration. According to the site assessment reports, the majority of these sites were recommended for complete replacement of the equipment. In addition to the Phase I work, LTPP solicited a Request for Proposal (RFP) for the work under Phase II. The Phase II contract was awarded in October and will have a base period of one year, with four option years. Also in 2004, Illinois, Maryland, and Texas installed concrete pavement at their SPS test sites for equipment installation and more States plan to follow suit. LTPP developed and solicited an RFP to begin work for the Pooled Fund Study TPF-5 (039). The intent of the Pooled Fund Study is to perform upgrades to the current FWD calibration centers and calibration process, as well as the software and hardware. The contract was awarded in September to Cornell University and will have a base period of 2 years, with 3 option years. Conduct detailed analysis of the effects of multiple freeze-thaw cycles versus deep frost penetration on pavement performance. Conduct detailed analysis of the extent to which local adaptations of materials standards and empirical pavement design practices have been effective at reducing the rate of pavement deterioration. The completion of the project is on schedule for September 2005. An annotated bibliography of these and other reports from previous years is available in the Library section of LTPP's Web site at www.fhwa.dot.gov/research/tfhrc/programs/infrastructure/pavements/ltpp/. This section also provides information on LTPP's resource documents, brochures, product briefs, TechBriefs, and application notes. LTPP's Web site is designed to provide information on the program's ongoing research activities. From LTPP's Web site, users can request or download products, view progress on LTPP analysis projects and pooled fund studies, get information about data collection, or check out the LTPP calendar to see where and when upcoming events/meetings will be held. LTPP Customer Support Services Center - your source for comprehensive, high-quality LTPP data and information.